Background: Despite the proof of principle that gene therapy can cure various monogenic diseases, limited clinical progress has been noted for gene therapy of the respiratory system. Certain anatomic features of the lungs, along with the suboptimal gene delivery vehicles utilized up to now, have significantly delayed successful clinical practice. Thus, the need for additional improvements towards safety and efficacy of the procedure is indispensable. 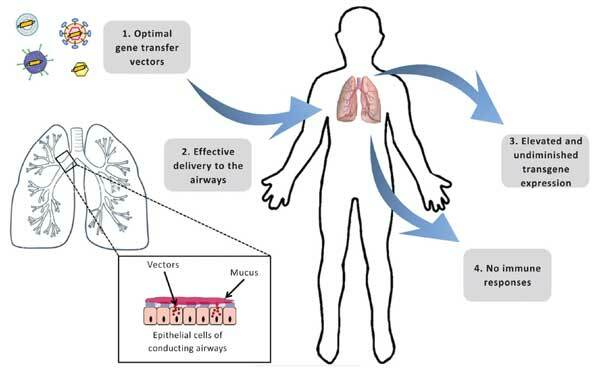 Objective: The objective of this work was to review the progress and limitations of gene therapy in the treatment of lung disease with a focus on monogenic disease, chronic obstructive pulmonary disease and asthma and to present studies that provide a proof of principle that it works in different model systems and in patients. Method: A thorough search was performed on the aforementioned topic using Pubmed in order to identify relevant manuscripts. Several gene therapy studies for monogenic disorders affecting other organs or systems were also taken into consideration. Results: A hundred and thirty one papers were included. Inclusion criteria regarded novel gene transfer technologies of the past decade, as well as publications outlining the pitfalls that precluded earlier successful implementation of gene therapy for pulmonary diseases. Conclusion: Current gene transfer protocols and vector design require additional amelioration. The rapidly evolving and much promising technology of CRISPR/Cas9 might possibly overcome the hurdles posed to date for effective implementation of gene therapy and become the basis for the onset of new clinical trials. Asthma, copd, DNA, gene therapy, lung cancer, pulmonary diseases.